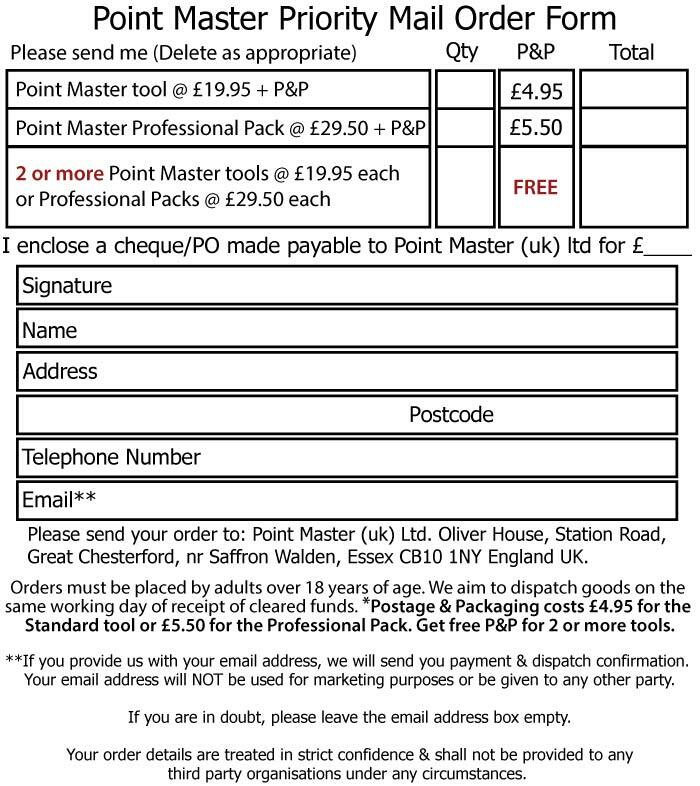 The PointMaster pointing gun tool Mail order form. For UK customers who want to order by post, please PRINT this page and fill in our order form below. To protect against fraud, please do not send your credit card details in the post. Instead you can enclose a cheque or postal order for the correct amount, including postage & packing. Please note that payment by cheque can take longer to process as it often takes 5 working days before payment is deemed as 'cleared'. Cheques and Postal Orders should be made payable to "Point Master (UK) Ltd". Please send your payment to: Point Master (UK) Ltd. Oliver House, Station Road, Great Chesterford, nr Saffron Walden, Essex CB10 1NY.